Quality E Cigs Guide. Best Electronic Cigarette UK. Best E-Cigarette reviews UK Why do I cough when Vaping? Why do I Cough when I Vape? Does *cough* vaping *cough* make you cough? A small but significant number of people have noted that when trying e-cigarettes and vaping for the first time they began to cough more than they used to. This is a common and well known factor when it comes to switching to vaping. For the vast majority of people who do experience this, coughing whilst using an e-cigarette is a temporary issue that goes away by itself after a very short period of time. Most people switching to vaping will probably not experience this. What exactly is making me cough? One of the reasons that you may cough when you first try an e cigarette is simply because your body is not used to vapour so your lungs reacts as if it is a foreign substance, much like a non-smoker trying a cigarette. To alleviate this when you first try vaping it is advisable to inhale with with small shallow breaths so your body can adjust. Another reason that can cause a gagging sensation or lead to coughing when vaping for the first time is that the nicotine content of the e liquid is to high. Start out with a low nicotine level, 3 mg or 6 mg to allow your body to adjust. It may well only take a few hours before your body becomes accustomed to vapour and you can then enjoy the full benefits vaping has over smoking. Another significant reason why people cough when first vaping is due to sensitivity of the propylene glycol (PG) found in e-liquid. In straightforward terms, PG is used in e-liquid as a base and its job is to act as a “carrier” for the nicotine so that it is more easily absorbed. Now a small number of the population, around 10% may, find that they are allergic to PG. It is important for those who react to PG based e liquid to use an alternative type of e liquid which has been developed. This alternative e liquid replaces the PG base with a Vegetable Glycerin (VG) base. VG is organic and typically slightly thicker than PG which can lead to clogging up certain e cigarettes and vaporizers. However pure 100% VG e liquids have been developed with a “thinner” constituency which now helps avoid this issue. 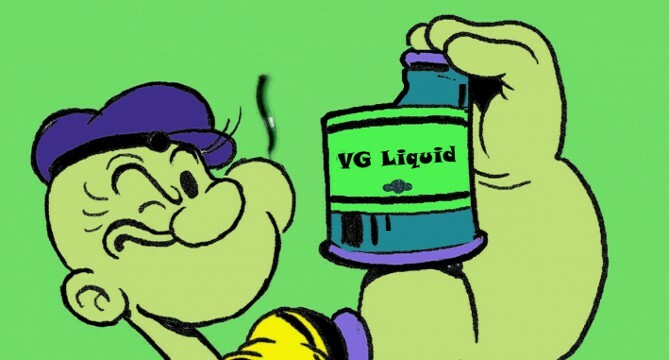 VG e liquid creates considerably more vapour clouds than PG e liquid but PG can give a slightly better throat hit than VG and it can allow better nicotine absorption. This can be countered by using a slightly higher nicotine strength VG e juice. When making the transition from smoking to vaping it is important to ensure your body is hydrated. PG e liquid can for some cause a little dryness in the throat which can lead to coughing especially in the first day or so, this dry sensation will go but it is always advisable to drink water through your vaping day. The e liquid in e-cigarettes offer much more of a variety than regular cigarettes with different flavours, potency and throat hit available. Therefore it may take a little time and some experimenting until you find the perfect product for you. Get the taste right first and then it is easy to find the correct nicotine strength. Many e-liquid suppliers sell variety packs, samplers of e liquid, so that you can establish which e juice flavour you prefer and it is advisable that you try one of these first. With the advent of the Tobacco Product Directive (TPD) in 2017, e cigarettes and e liquid should start to get safer as legislators ensure compliance with minimum standards.